The Blue Texel breed originates from the Netherlands; they were originally recorded during the early 1970s. It was by chance that a blue sheep was born to white Texel parents. “Blue” is the geneticists name for the colour pattern and is referred to as the Abl gene – a recessive gene found in all Texel breeds. If 2 white Texels carry the “Blue” gene then there is a 25% chance of a blue lamb being born. However, if both parents are blue in colour then the lambs born will always be blue. Flocks have since been formed in the United Kingdom following importation from the Netherlands along with blue sheep being born by chance in pedigree White Texel flocks. 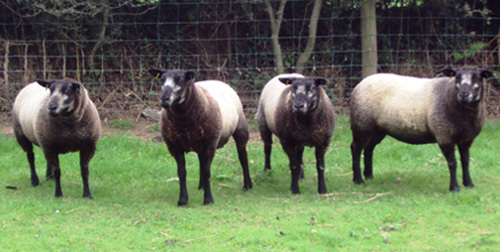 Blue Texel sheep, with their unusual appearance are very popular to the pedigree breeder who wants something different and also to the hobby farmer who wants a few distinctive sheep in their paddocks. However, the breed also has an appeal to the commercial farmer. The blue pattern found in their fleece varies from sheep to sheep; it can be a very pale colour or a slightly darker grey colour. The fleece will be darker on the shoulders getting lighter over the back. It is important to note that the colour of the fleece should not be black. similar to a halter mark. Ears should have white tips. the tail and on the upper front legs.